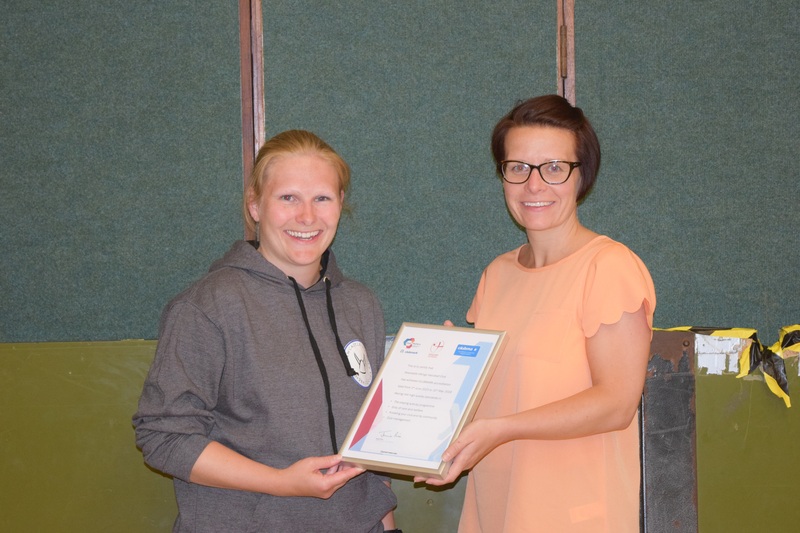 Newcastle Vikings Handball Club have become the only handball club in England to achieve the prestigious Clubmark accreditation. Clubmark is a national accolade for sports clubs, awarded in recognition of achieving high quality standards in child welfare and protection, coaching, club management and a range of other measures designed to ensure the club is well managed. As well as training regularly at both South Tyneside and the Percy Hedley Sports Academy in Killingworth, Newcastle Vikings Handball Club also spend a lot of time visiting schools to introduce the sport during PE lessons and at after-school clubs. Handball is a team sport which involves two teams of seven players; it is played at an extremely high pace and is suitable for males, females and juniors of all levels. There are now approximately 19 million people playing the sport worldwide and it has been an official Olympic sport since 1936. Jade Mackie (Tyne & Wear Sport) presenting the Clubmark award to Marlen Slinning and some other members of the Newcastle Vikings Handball Club. Next Post:Vikings set to go into Battle on the Beach!